Since the Fivepeat became a reality, many Clemson* fans have sucked it up and admitted the obvious: that they were beaten, again, by the better team. There are certainly some reasonable and rational Clemson* folks out there who understand that college football success is mainly about blocking and tackling better than, and holding onto that funny shaped object more than, the other guy. The other stuff that folks talk and write about, for the most part, is just noise. Well, the noises coming out of many orange and purple types since the game has been pretty humorous, and in some respects a little bit sad. Admittedly, I remember similar garbage being spewed by many of our fans over the years when we got our arses handed to us in November. In essence, the losers of the game want to make themselves feel better about their deficiencies by making excuses and/or disparaging the opponent. No Class. Sure, you won the game, but we have more “class” than you. If winning the game requires us to act like you, we’d rather lose. The Gift. You didn’t beat us; we gave it to you. You Cheated. You don’t play fair-we would never do that. Unfair Advantage. You get players we can’t get. You Were Lucky. But for a couple of weird bounces, we would have won. The whole “class” argument is so tired and ridiculous. Over my many, many years of football viewing, I have witnessed fans on both sides who act like total idiots and embarrass those of us who try to be civil about this stuff. After all, it’s football, not life and death. Many CTU fans love to make the case that Dabo is “classier” than the HBC. I gather this is based on the fact that our coach jabs at Clemson* on occasion. To this I say: GROW UP! Again, this is a GAME played by boys. It’s supposed to be fun. And guess what: To the winner go the spoils. In this case, the “spoils” are bragging rights. The winner is supposed to talk a little smack. That’s the whole point. What’s even more puzzling is that Clemson* fans still want to declare Dabo the classiest of the classy, even after his now infamous rant. I think I speak for most Gamecock fans in saying that we will be paying him back for that childish tirade for quite some time, if not forever. And while I’m on this subject, let me address some bellyaching I have heard about some “fivebombing” photos recently taken with the Dabo. A Clemson* radio host recently devoted a large part of his show to this subject, lamenting that it isn’t “classy” and is an insult to Dabo (who is after all, a man of the people). Again, it’s a rivalry. I think poor Dabo and his seven-figure salary (earned by coaching a bunch of boys to tote a ball around) can take it. Quit with the bitching and moaning. It’s unbecoming and downright pathetic. A guy who can insult our team and university the way he did cannot be fivebombed because he is “classy” and might get his feelings hurt? Man up Clemson*. Please. A common theme emanating from the upstaters is that they are actually the better team, with the better QB, but “gave” us the game by turning the ball over 6 times. Funny but I don’t recall any pick sixes or fumble returns for a TD. Instead, I recall a 17 play, 80-yard drive after the first interception. And don’t tell us that you are better because of Hot Rod’s runs or the total yardage stats. The fact remains that we out rushed CTU, again. And the time of possession was lopsided in our favor, again. Boyd flaked out when facing our D, again. Five in a row is no fluke, it’s a trend. While this game was not exactly like the last four, it was similar in many respects: all of the wins have been by double digits; all the games involved forced turnovers; all the games involved decisive drives by our offense at key times. The QB debate is laughable. Boyd threw more interceptions in the last three minutes of the game than Shaw did all season. Sure, Boyd has all the flashy stats built up against a cupcake schedule. CTU can have Boyd and his stats. We’ll take Shaw and his wins. Give credit where credit is due. The cheating claim is rich given the history of the series (can you say “pushoff”). But blaming a loss on a flinch by a center on 4th and 1 is kind of weak, don’t you think? First of all, I don’t think Shaw “cheated” when he gained 12 yards on 3rd and 13. I guess the Clemson* faithful have conveniently forgotten about that play. Instead, they are focused on an alleged intentional flinch by our center on 4th and 1. They pay no mind to the fact that EVERY team in that situation tries to draw the other team offsides. I mean its down right routine for a team to shift around a bunch and bark out a hard count. The offensive team is going to do whatever is necessary to induce movement. It’s only a penalty if it’s called, right (see pushoff again)? The downside? Five yards. Cheating? Hardly. Standard football protocol in that situation? Absolutely. How about NOT jumping offsides after a timeout. How about NOT giving up 12 yards on 3rd down. That damn karma (see pushoff) will get you every time. When we win there’s always a faction of CTU fans who want to make the “academic” argument, that the guys beating them couldn’t have gotten into Clemson*. Again, this is an excuse meant to divert attention from the facts. The facts are that all major football schools in the ACC and SEC compete for the same players. Special admits abound on every roster. For the most part, it’s not a bunch of walk on Rhodes Scholars running around the last Saturday in November. Do we want our guys to graduate and be successful? Sure. But let’s not kid ourselves. These guys are on campus, at both schools, to play football. If a player can help a team win, chances are he will eventually find his way to the field. This is the case everywhere, including Clemson*. None of the big boys make the academic argument when they lose. The “you were lucky” claim is yet another failed attempt to mask the truth-that the better team won. Brison Williams wasn’t “lucky” when he read pass and made the interception, and Chaz Sutton wasn’t “lucky” when he ripped the ball away from Boyd. “Losers find a way to lose and winners find a way to win.” I can’t take credit for this statement, but I heard it after the game and thought it pretty much summed things up on this “lucky” argument. 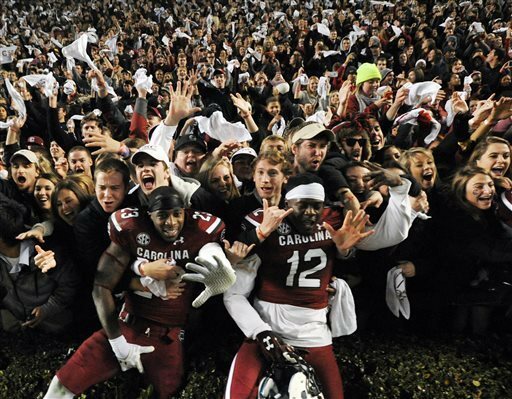 The turnover margin during the Fivepeat is plus 12 (15 to 3) in favor of the Gamecocks. That doesn’t sound like luck to me. Sounds like a winner and a loser. The fact is: we blocked, tackled and protected the ball better than Clemson* did. That won us this game and the previous four. Enjoy the victory and the Fivepeat. Ignore the noise, because that’s all it is. Heard much of the same. Heard a local radio show commenting on how difficult it is to get players into the ACC as compared to the SEC. He was saying that hands down the ACC is a stronger academic conference than the SEC and this affects their play on the field. I think the greatest advantage South Carolina has over Clemson is three things. First, players. Secondly, coaches who actually out coached Clemson. And Third, the SEC prepares the Gamecocks for games with Clemson. Clemson’s toughest games to prepare for USC were Georgia and FSU. South Carolina faced the likes of UGA, Florida (who has a good defense no matter what you say about their offense), Missouri (who would pound Clemson), and Tennessee. This prepares South Carolina for Clemson and beating them in the mouth.